John Kerry at Moscow's Vnukovo-II airport, March 23, 2016. 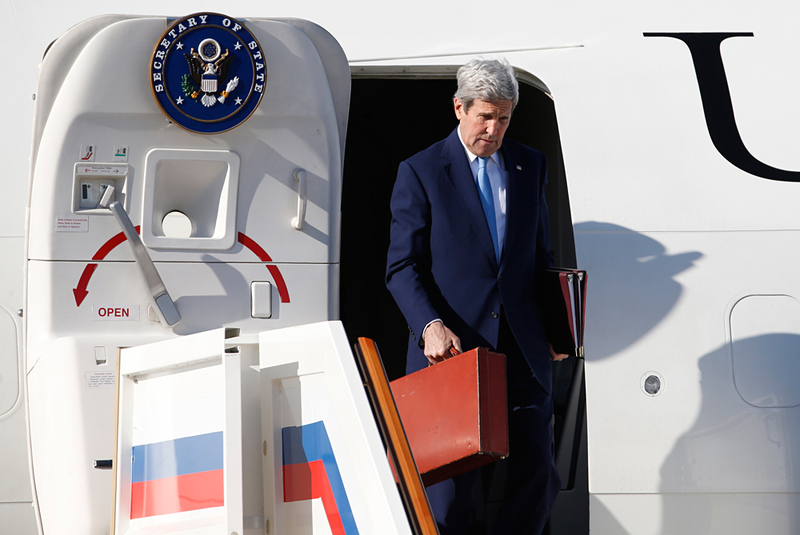 The bag U.S. Secretary of State John Kerry has been carrying around during his visit to Moscow contained nothing but documents for the negotiations, Russian Deputy Foreign Minister Sergei Ryabkov has said. "There were just documents for negotiations with Lavrov and Putin," he told reporters. Negotiations between Kerry and Russian President Vladimir Putin took place on March 24. At the beginning of his meeting with the U.S. secretary of state in the Kremlin, Putin said he saw the U.S. foreign policy chief carrying his luggage when he alighted from the plane and assumed that the bag contained money for bargaining with Russia. "Today, when I saw you coming down from the plane and carrying your effects, I got a little upset. On the one hand, it is very democratic; on the other, I think: things are really bad in the U.S., there is no one even to help the secretary of state carry his briefcase," the Russian president said. "The [U.S.] economy seems to be alright, no major cuts," Putin said. "Then I thought: maybe, there is something in this briefcase that you could not trust anyone with, something valuable. Apparently, [you] brought some cash so that we can bargain better on key issues," the president said, smiling. Kerry replied by promising to show the Russian president what is inside his briefcase when the meeting proceeds one on one. The press asked Kerry about the content of his bag after the negotiations but he refused to tell them, noting that the secret was known only to him and Putin.